Spotlight Search displays various ‘news’ headlines in modern versions of iOS for iPhone and iPad, and while some users may find this information useful, others don’t care to see what are often tabloid-like headlines splashed across their iPhone and iPad search function. Fortunately with a little effort you can quickly turn off the News headlines from Spotlight and stop them from appearing entirely in iOS search results. 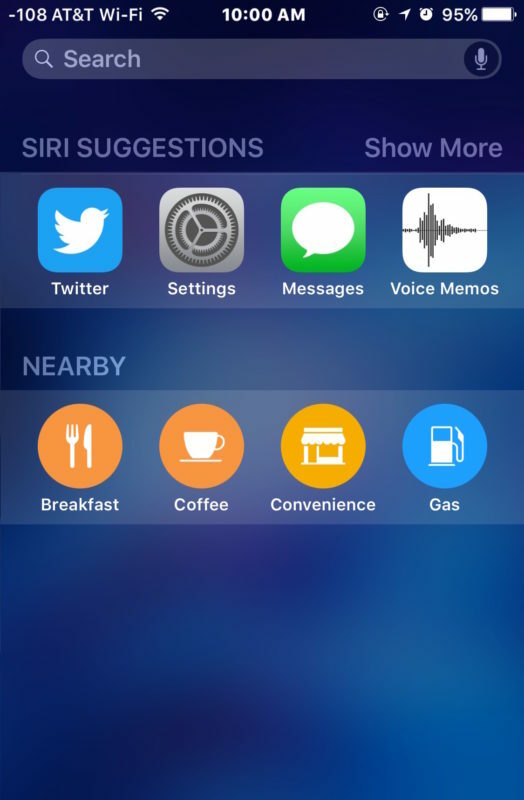 We’re focusing specifically on removing News headlines from Spotlight Search suggestions, but if you want to remove all the suggested stuff like Contacts, Locations, and apps, you can turn off Siri Suggestions which removes every suggested thing from the Spotlight screen except for Spotlight search functionality. To be clear, we’re talking about the random “News” headlines that show up under the Search feature when you access Spotlight. Additionally, we’ll show you how to stop news articles from showing up when you just want to search your device for something too. Return to the Home Screen and swipe over to see the Spotlight Search section again, no more ‘news’ headlines! 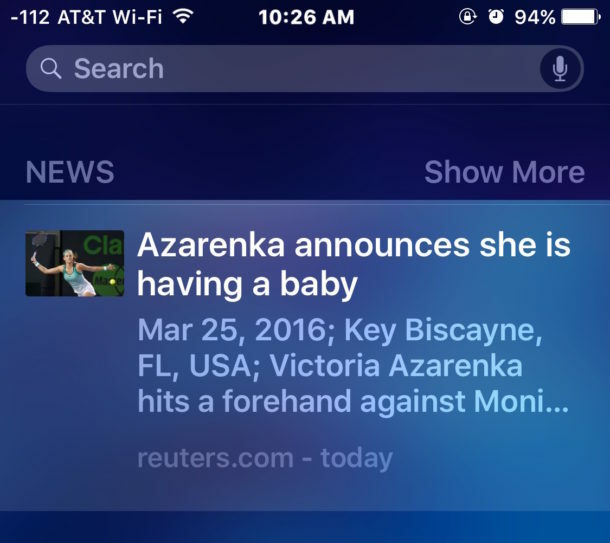 This is a bit cleaner in appearance, but toggling the settings off also prevents things like some celebrity baby announcements from showing up when you’re really looking for information about your cousins baby announcement instead. As you likely noticed, the setting to toggle these News headlines from appearing at Spotlight is a little less than clear. A setting called ‘Spotlight Suggestions’ winds up controlling news headlines from appearing in Spotlight, whereas if you only toggle the “News” setting off on it’s own, you’ll still see the News headlines appear at the Spotlight screen, but you won’t see news show up in search results. 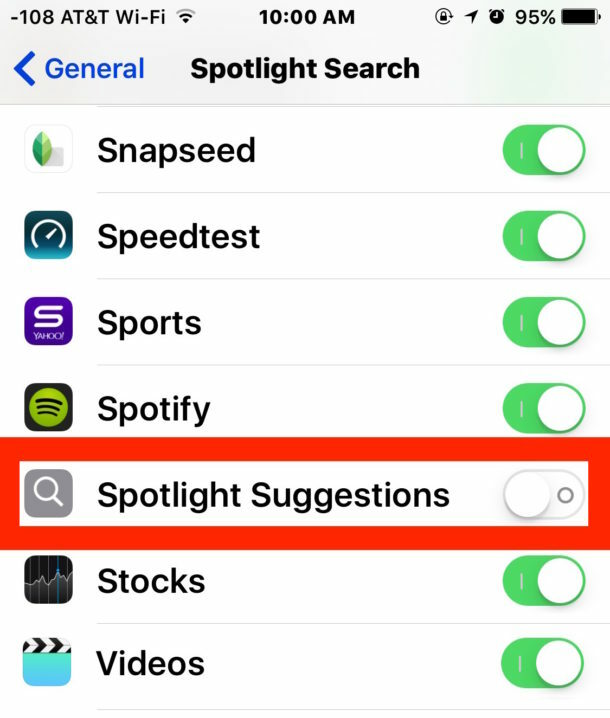 Thus, you have to turn off both News and Spotlight Suggestions to remove the “news” from the Spotlight Search screen entirely. Now the Today widget screen won’t show the (often obnoxious) News headlines either. The News and Suggested News headline feature could be more useful if users were given some control over what appears in the suggestion list, but for now there is no method of determining what sources or what type of articles, topics, or news you want to be suggested to you at the Spotlight screen. So for now it’s a choice between having some legitimate news mixed in with plenty of tabloid, opinion, pseudo-news and sensationalism, or nothing at all. For me personally, I turn the feature off as I don’t find it helpful or relevant, but undoubtedly many users will like having the random mixture of headlines show up in their Spotlight on iPhone, iPad, and iPad touch. Try it out either way, you can always reverse the change and either get the news and tabloid headlines back, or hide them again. Absolutely hate the News rubbish, turning this off immediately. THanks! I hate the fake “News”, it reminds me of being at a magazine stall in NYC, it is all trash! Rumor mongering fake news about politicians personal lives and hearsay typical media trash, there is literally ZERO real news and zero policy discussion. Apple “News” is NOT real NEWS. It’s focus on fake inconsequential media garbage is exactly the mainstream media trash which has led the USA into the toilet! Apple should be ashamed to release a tabloid feature! Sounds messy, but thank God. I wasn’t getting News stuff in my spotlight suggestions or on lock-screen. I am astounded that the news feed is not configurable. How is it not tied to the favorites the user has specified in the actual News APP? Ridiculous. Terrible UX. He may have been a pr*ck, but man I miss His Steveness. Took a big step back introducing this app and news feed who wants to read that garbage anyway!! Glad to get this “news” crap off my phone. Worse than Facebook “trending” BS. During this election year this so called news is really an Apple controlled propaganda effort. Slander presented as news. So sick of it, so happy to finally get it OFF my phone and out of my brain. Thank you! I agree, I see nothing but Trump and Clinton articles! I turned them all off, it’s all trash fake news. I can’t believe every day this freaking week it has been some ridiculous story about Trump on the top. I can’t believe these social media idiots are controlling and manipulating the news. So disgusted. I turned it off but these steps didn’t work on ios10. To remove it swipe to see the news and go to the bottom and click edit to remove this trash. Thank you! I found the news abominable, and it was not intuitive to remove it. Thank you. Could not find it on my own! i’m on ios 10.0.3 and spotlight suggestions has seemed to move, any idea how I can remove this news feed off my phone? I was getting sick and tired of swiping right on my phone and seeing the Huffington Post right alongside legitimate news sources. Thank you for showing me how to turn the feature off entirely. I don’t have spotlight suggestions listed on my phone yet I get these annoying news shorts. What do you suggest? I just want Fox “News” off my feed as it is not a legitimate news source. Over half of what Fox “News” publishes is completely made up. I was looking to do this… but there’s no Spotlight Search option in iOS 11. ??? I like the spotlight feature, but want Fox News removed completely on my phone. An administration propaganda operation is not news.